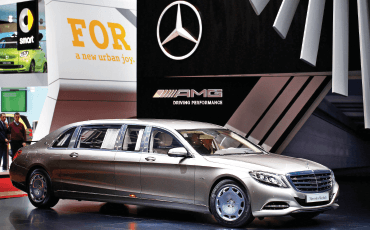 MERCEDES has finally unveiled the Mercedes-Maybach S600 Pullman, a limited-edition limo that will cost US$1 million (RM3.68 million) in armoured form. The car, which made its global debut last week at the Geneva Motor Show, is a new version of the Pullman Mercedes first made in 1963 as a conveyance for high-ranking monarchs and heads of state. The car is a full metre longer than the S Class sedan, from which it evolved. Elvis, a king in his own right, owned one. So did Coco Chanel and Elizabeth Taylor. These days, I’m hoping Kanye and Kim get one. Or maybe George and Amal Clooney, for pulling up to red carpet events such as the Oscars. The new version is based on the modern S Class sedan, with a wheelbase a full metre longer than a car. It has a 530hp V12 turbocharged engine and specially refined suspension and transmission systems to ensure that any ride in the back of this goes undisturbed by whatever is happening on the outside, whether it’s paparazzi or hand grenades. Inside, you can make the car whatever you want it to be. (Popular necessities include hand-stitched leather pillows, silver champagne sets, and privacy curtains.) John Lennon installed a special hi-fi sound system in his during the late 1960s. You, on the other hand, could add champagne coolers, a theatre system, a fragrance system and any number of supple leather and exotic wood combinations. The floor mats are thick and plush and the windows cancel out virtually all exterior noise and harmful UV rays. The quilted stitching on the dashboard and centre armrest alone is far superior to the interiors of lesser vehicles. And if you haven’t guessed, the back is big enough for three rows of seats, or a lay-flat lounger. I’d go with the lounger.